2001: Narrative and Musical Parallels. “Ultimately, 2001 is a film that suspends that coordination of the human body, and thus human nature, in such conditions- even as it suspends our final judgments about human nature in its open-ended conclusion about our future development.” Decker – (2007, p.101). “During the editing, Kubrick eliminated a few scenes and became so enamoured of the “needle drops” of classical recordings he had used for temporary music that he decided to abandon an original score he had commissioned from composer Alex North. His eclectic choice of music – consisting of passages from Richard Strauss’s Also Sprach Zarathustra, Johann Strauss’s Blue Danube, Aram Khachaturian’s Gayneh and Gyorgy Ligeti’s Atmospheres, Requiem and Lux Aeterna -would eventually become one of the film’s most widely discussed features.” (2007, p.141). However, from his mistaking of Strauss for Wagner in a later paragraph, it is clear that this interest has only been discussed without any real musicology in mind. The film’s opening with Atmosphères is one of the most striking in Western cinema chiefly because it is a big budget film that is confident enough to let a piece of 1960s, avant-garde, classical music set the scene for a long, complex narrative that, even with analysis, can still remain ambiguous. The relationship between the film and Atmosphères is an endlessly interesting one, precisely because it can tell the viewer and the reader so much about the narrative as well as suggest key themes. Instead of relying on a relationship built from epic expanses (perhaps letting Atmosphères capture a more unnerving, horrific sense of space travel) Kubrick has opted to let Ligeti’s piece play over a blank screen. The questions surrounding this strange phenomenon of popular cinema are answered by both the film’s narrative, its parallels with its various uses of music and, most importantly to this essay, the musical analysis of Atmosphères itself. “To deal with a specific example, time is undeniably constitutive of music. But nothing is less important to actual music than time. In listening to music, temporal events on the outside of the musical continuum remain external and do not impinge on musical time.” (1970, p.199). With this pleasing parallel, this blank screen, in basic narrative terms, can therefore be considered the universe before life came into existence (in spite of the deliberate narrative juxtaposition of hinting at higher powers through the presence of the obelisk). If this is so, then what role does Atmosphères musically play in this relationship? Throughout the film, Ligeti’s other music is used as a leitmotif of a huge, black obelisk which is suggested to start the various stages of man’s evolution. This often comes in the form of Ligeti’s Requiem, hinting at some higher power at play with its quasi-religious vocal layers. If we were to take this general reading at face value, ignoring the previous musical analysis, the use of Atmosphères could just be another use of this fluid leitmotif. Abrams believes this power to be a negative or pessimistic trait in the film rather than a positive one, arguing that “The real problem here is that along with the old cosmology, we have also lost the religious foundation for all our values -values that, like ourselves, seem to float hopelessly in the abyss.” (2007, p.250). The later use of Atmosphères in the film’s famous Stargate sequence would also back this reading up, but it is an over-simplistic one that ignores the detailed musical relationships within Atmosphères itself. It would further imply that the black opening screen somehow ties in to the obelisk itself which is a flimsy reading of the basic narrative functionality of the film too. It therefore comes down to the analysis of Atmosphères where Kubrick’s logic behind the use can be found. It is rare in itself to find a piece of music in cinema that is allowed to stand without a visual companion (a relationship later disregarded when Atmosphères is mixed at will with Requiem and various sound effects during the film’s most visual of sequences) so Kubrick must find something in Ligeti’s music that requires its full presence to be essential to being an overture to his most important film. The first thing to consider is the idea of perception and how the distance from perceiving an initial chaos can, in fact, come to make sense when tracking out further to incorporate a full picture. There is a sense of this in both the film and Atmosphères; that the initial reaction is almost incomprehensible because our distance from it is too little to perceive the bigger picture. In the film’s case, this is the very idea of evolution, which only becomes apparent in the context of the whole narrative rather than during it (though inklings may be felt during the film’s initial twenty-minutes). “The overall form of the piece is to be realized as a single, wide-spanning arch – the individual sections melting together and subordinate to the arch.” (p.2, score). This arch is one of the basic likenesses between the two works, created by Kubrick through a series of large scale events and by Ligeti with his dynamics and textures. The film seems to represent more chaos themed sets of circumstances (violence of early man, a malfunctioning computer, the dissolving of reality itself) but has the Ligeti-esque ideal that tracking back suggests a greater order of things; that our seemingly nonsensical reality only seemed so because the expanse was viewed at too close a distance. “At the basis of this work, however, lies precise calculation. The most delicate network is woven from a single thread. The micropolyphony of the piece, which the ear cannot separate into its component parts, proves to be a strict multivoiced canon (at times, a double canon).” (2002, p.225). “For Ligeti the process of composition begins not with a calculation of form but with close attention to the sonorous image of the future work – a sonorous image somehow independent of the composer’s will, one that exists in his imagination and demands outward expression.” (2002, p.228). Here, Schnitkke’s argument can be neatly contextualised into the narrative of 2001. The inner workings of humanity within the film are only given a true outward expression by the presence of an obelisk which is supposed to push humanity forward at its every appearance. 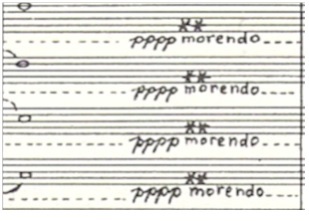 While Ligeti, especially within Atmosphères, did not necessarily concentrate upon direct outward expression of his will, his act of composing in such a style of micropolyphony could be said to have been his own obelisk. Drawing back to the film’s actual use of the music during its opening, the musical analysis of the previous section can be shown to foreshadow the narrative that proceeds it. Naremore describes Kubrick’s narrative as “At one extreme, we have the monolith that symbolises non-human technology and intelligence – dark, totemic, impervious, reflective of light, both Freudian and Jungian, suggesting both ultra-modernism and monumental force…” (2007, p.149). This is also an apt description for Ligeti’s Atmosphères. Kubrick fails to use the piece in its entirety and instead focuses on the segment that was analysed in the previous section. This isn’t a coincidence in terms of the analysis; at this point in the score, Atmosphères was shown to have its first dynamic and tonal build with perhaps the only optimistic moment within the score. Putting emphasis on this section somewhat recontextualises the piece, which becomes removed from The Holocaust reading of the music as suggested within the previous section. This optimistic chord can be found in the second shift during this first dynamic moment. 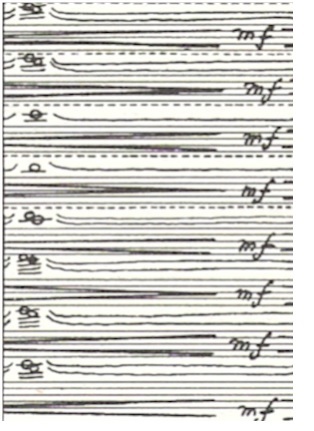 The notes of the first violins are shown below. While again there is a sense of unease and tension within the cluster of notes grouped together, this moment feels more positive than any other moment with the piece. This may perhaps be because within this segment, the entirety of the C Major scale, ever the haven of solid, tonal structures, is present allowing for enough positive relationships to form chords as well as clashes between unconventional intervals. This optimistic nature may seem confused but it also seems to be Kubrick’s main driving force within using it for the film’s overture. The moment when the universe, man and (within the film) the Star Child come into existence, it is preceded by a moment of cataclysm and pain. The explosion that starts the universe is unseen within the film (at least at the beginning) but is heavily hinted at through the presence of this particular section of Atmosphères. The narrative later on also suggests that evolution is a painful process but one that has optimistic outcomes. This is where Atmosphères‘ musicality is at its strongest in its foreshadowing. Even the trumpets within this moment have some form of cohesion within this moment. Within these notes are an inversion of a Dmin7 chord (D,F,A,C) which may hint at a more sorrowful trajectory but, in the context of the tonality of the rest of the piece, this strong tonal and dynamic presence is ironically one of its great examples of optimism. While the remaining textures that Kubrick uses of Ligeti’s micropolyphonic orchestration are largely the more ambiguous and dynamically quiet sections (creating a vast but subtle tapestry of space) , it is within this moment that 2001 is suggested to be a process; one that is both seemingly chaotic, painful and raw but also positive, necessary and optimistic of its outcomes. Patience (Grant Gee) and The Rings of Saturn (W.G. Sebald) – Capturing Perception. For Those In Peril (Paul Wright, 2013) – The Reality of Lore.